After years of advocating for it (he's seen here doing so in 2015), the Dream Act passed the state legislature in January. 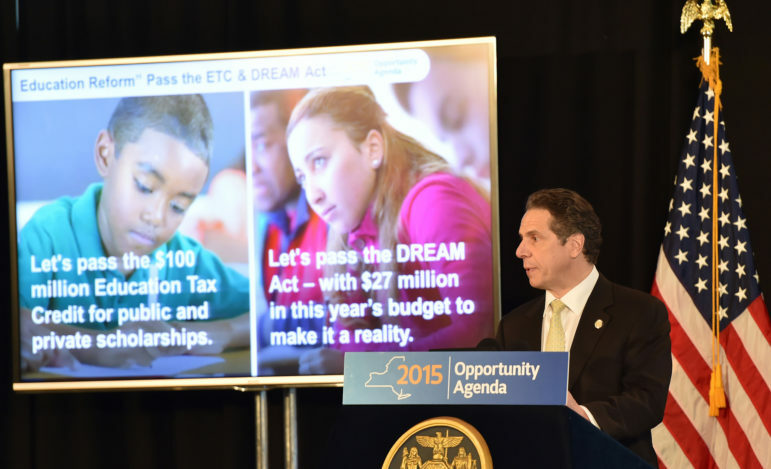 In the past few weeks, the New York State legislature has passed several important pieces of legislation. But, after years of gridlock that blocked efforts to ensure respect and dignity for immigrants and work-class people of color, our state still has a long road ahead to deliver true progressive change. Donald Trump and his administration’s onslaught on immigrants and working people of color continues—especially for transgender people of color like me. But, our community is resilient and strong. And while we know Trump won’t sign bills that benefit us in Washington, we can and must fight for concrete policy changes here in New York. That’s why, today, I’m joining hundreds of immigrants and working-class people of color from Make the Road New York to head to Albany to ensure the New York State Legislature and Governor Cuomo deliver concrete policies to protect all New Yorkers and ensure equal opportunities for all, which we’ve laid out in our #HeretoStay platform this week. First, to truly stand up for immigrants, New York must restore driver’s licenses for all, regardless of immigration status. Our communities need to be able to freely move from one place to another, without fear that a simple traffic stop can lead them into the deportation pipeline. Driver’s licenses are also critical for transgender immigrants. Access to a license would allow us to travel without harassment on the train, or on the bus, and it would even allow me to visit family members and other communities who have been supportive of my transition. New York must also pass universal rent control. I have personally faced harassment from my landlord and regularly see how my neighbors face steep rent hikes that displace them from our community. In our state there are currently five million New Yorkers who do not have any protections as tenants, because our state has been prioritizing real estate developers and landlords over working-class New Yorkers. Every tenant in our state, regardless of where they live, deserves equal basic protections. Our students also need protections from racial disparities in school discipline. We’ve seen how this long-time problem is getting worse under the Trump administration, which seeks to criminalize Black and Brown youth. Late last year, we saw how his administration eliminated federal guidelines to stop the school-to-prison pipeline. And, on Long Island, we’ve seen federal agencies recklessly mis-label immigrant youth as gang members and put their lives at risk. New York must act and protect our youth and end the school-to-prison and deportation pipeline by passing the Safe and Supportive Schools Act. These are not, of course, our communities’ only priorities. Black, Brown, and transgender people need police accountability legislation. Families need additional resources for public schools, adult education, civil legal services, and health care. And voters need automatic voter registration and a public financing system that levels the playing field so all voices can be heard. And it’s time to say no to enormous taxpayer giveaways to Amazon. Our communities to stand up every day to say that we are here to stay. Now it’s time for legislators and the governor to take bold, progressive action to show us that they hear our voices.